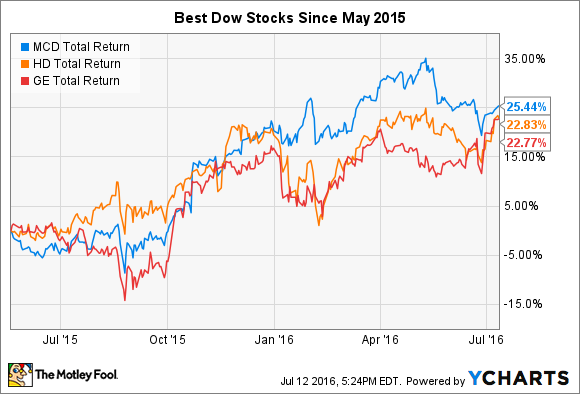 These stocks gained more since the previous all-time high than any other Dow stocks. The Dow Jones Industrials (DJINDICES:^DJI) reached new all-time highs on Tuesday, setting its first record in more than a year. Investors pointed to new optimism about the course of the stock market despite long-term concerns about macroeconomic conditions worldwide and the potential for geopolitical disruptions. Yet looking back over the past 14 months, you can see that out of the 19 stocks that have climbed since the previous May 2015 highs, three companies really stand out as having produced strong returns. Below, we'll look at these three stocks to see whether they'll continue to help support the Dow in the months and years to come. MCD Total Return Price data by YCharts. McDonald's (NYSE:MCD) has led the Dow higher over the past 14 months, posting a total return of more than 25% over that time period. The stock's dividend yield of nearly 3% has played a role in helping to bolster the fast-food giant's stock, but a critical strategic move concerning its menu offerings has been more important in sending McDonald's shares higher. What has really stood out for the company recently has been the success of McDonald's new all-day breakfast initiative. Many investors were skeptical that offering breakfast at any time of day would have all that big an impact on the fast-food company's results, especially because they figured that breakfast items would only cannibalize sales of lunch and dinner-oriented menu listings. However, what McDonald's has found is that customers are interested in purchasing individual breakfast items as add-ons to their regular meals, combining burgers with hash browns or Egg McMuffin sandwiches with fries. With shareholders seeing a chance for McDonald's to succeed, they've been willing to bid up the stock price substantially even though the Dow has made only marginal progress. Home Depot (NYSE:HD) has also performed well, posting a total return of 23% over the past 14 months. The continued strength of the housing market has played a key role in Home Depot's ability to keep climbing, especially given how well the home-improvement retailer has held back competition not only from rival big-box home-improvement specialists but also from online retail threats. One of Home Depot's most important initiatives has been its effort to appeal to professional contractors. The business that Home Depot gets from do-it-yourself homeowners will always be a vital part of its overall sales, but as the economy has improved, more homeowners have gotten themselves into a financial position in which they can afford to hire a contractor to do work for them. By ensuring that the switch from do-it-yourself to contract work doesn't jeopardize its business, Home Depot has reached out to professionals and offered them work-saving and money-saving deals that make their lives easier. The rise in the stock price points to the success of Home Depot's dual-front approach, and it will remain essential even as the Dow hits new record highs. One surprising entry on this list of successful Dow stocks is General Electric (NYSE:GE), which has also risen 23% since the May 2015 record close. The reason why this might come as a shock to many investors is that several of GE's lucrative segments have hit the skids over the past year. In particular, General Electric had only recently made a substantial push into the oil and gas side of the energy industry, and that move proved ill-timed given the massive decline in crude oil prices that took place throughout 2015. However, several of General Electric's other segments have offset the weakness in fossil fuels. The aviation segment continues to benefit from strong demand for new aircraft, and GE engines play a useful role in new aircraft models around the world. At the same time, General Electric's renewable energy segment has taken off, growing both from organic sources as well as through the company's acquisition of the power businesses of Europe's Alstom. By making that purchase, GE became an even more dominant global player in the renewables business, and more opportunities worldwide could lift the company to even greater heights. Celebrating the Dow's new milestone is exciting, but these three stocks carried a lot of the weight to get the average to new record highs. If they can keep up their momentum, all three have the prospect to climb higher still in the future.